then can be interpreted as superfunction of function . Such definition is valid only for positive integer . The most research and applications around the superfunctions are related with various extensions of superfunction; and analysis of the existence, uniqueness and ways of the evaluation. For simple function , such as addition of a constant or multiplication by a constant, the superfunction can be expressed in terms of elementary function. In particular, the Ackernann functions and tetration can be interpreted in terms of super-functions. logos of the Phys.Dept. of the MSU and that of Math.Dep. Analysis of superfunctions came from the application to the evaluation of fractional iterations of functions. Superfunctions and their inverse functions allow evaluation of not only minus-first power of a function (inverse function), but also any real and even complex iteration of the function. Historically, the first function of such kind considered was ; then, function was used as logo of the Physics department of the Moscow State University . (Mathematicians of the same University were not so arrogant and used the symbol of integral and the Moebius surface at their logo, see the figure at left). The inverse function, id est is an entire super-exponential, although it is not real at the real axis; it cannot be interpreted as tetrational, because the condition cannot be realized for the entire super-exponential. The real can be constructed with the tetrational (which is also a superexponential), and the real can be constructed with the superfactorial. The plots of and in the complex plane are shown in the right hand side figure. For extension to non-integer values of the argument, superfunction should be defined in different way. where is any 1-periodic function, holomorphic at least in some vicinity of the real axis, such that . The modified super-function may have narrowed range of holomorphism. The variety of possible super-functions is especially large in the limiting case, when the width of the range of holomorphizm becomes zero; in this case, one deals with the real-analytic superfunctions . If the range of holomorphism required is large enough, then, the super-function is expected to be unique, at least in some specific base functions . In particular, the super-function of , for , is called tetration and is believed to be unique at least for ; for the case , see ; but up to year 2009, the uniqueness is rather conjecture than a theorem with the formal mathematical proof. The short table of superfunctions is suggested in . A little bit more extended table is available at TORI . Some superfunctions can be expressed with elementary functions, they are used without to mention that they are superfunctions. For example, for the transfer function "++", which means unity increment, the superfunction is just addition of a constant. Chose a complex number and define function with relation . Define function with relation . Then, function is superfunction ( to ) of function on . Exponentiation is superfunction (from 1 to ) of function . Let . Then, is a superfunction of . The example above and the two examples below are suggested at . More general case refers to the logistic transfer function where is parameter; the corresponding superfunction is called logistic sequence ; . Within wide range of values of parameter , the logistic sequence is holomorphic function of ; at , it can be expressed in a way, equivalent to the representation above  . which is superfunction of for . Let , , . Then, tetration is a superfunction of . Inverse of superfunction can be interpreted as the Abel function. The definitionm above does not reuqire that ; although, from properties of holomorphic functions, there should exist some subset such that . In this subset, the Abel function satisfies the Abel equation. in the definition of the superfunction. However, it may hold for from the reduced domain . Superfunctions, usially the superexponentials, are proposed as a fast-growing function for an upgrade of the floating point representation of numbers in computers. Such an upgrade would greatly extend the range of huge numbers which are still distinguishable from infinity. Other applications refer to the calculation of fractional iterates (or fractional power) of a function. Any holomorphic function can be declared as a "transfer function", then its superfunctions and corresponding Abel functions can be considered. A superfunction allows to calculate the fractional iteration of some transfer function . Once the superfunction and the Abel function are established, the fractional iteration can be defined as . Then, as changes from 1 to , the holomorphic transition from function to is relalised. The figure at left shows an example of transition from to . Function versus real argument is plotted for . The tetrational and ArcTetrational were used as superfunction and Abel function of the exponential. The figure at right shows these functions in the complex plane. At non-negative integer number of iteration, the iterated exponential is entire function; at non-integer values, it has two branch points, thich correspond to the fixed points and of natural logarithm. At , function remains holomorphic at least in the strip along the real axis. In the investigation of the nonlinear response of optical materials, the sample is supposed to be optically thin, in such a way, that the intensity of the light does not change much as it goes through. Then one can consider, for example, the absorption as function of the intensity. However, at small variation of the intensity in the sample, the precision of measurement of the absorption as function of intensity is not good. The reconstruction of the superfunction from the Transfer Function allows to work with relatively thick samples, improving the precision of measurements. In particular, the Transfer Function of the similar sample, which is half thiner, could be interpreted as the square root (id est, half-iteration) of the Transfer Function of the initial sample. Similar example is suggested for a nonlinear optical fiber . It may have sense to characterize the nonlinearities in the attenuation of shock waves in a homogeneous tube. This could find an application in some advanced muffler, using nonlinear acoustic effects to withdraw the energy of the sound waves without to disturb the flux of the gas. Again, the analysis of the nonlinear response, id est, the Transfer Function, may be boosted with the superfunction. In analysis of condensation, the growth (or vaporization) of a small drop of liquid can be considered, as it diffuses down through a tube with some uniform concentration of vapor. In the first approximation, at fixed concentration of the vapor, the mass of the drop at the output end can be interpreted as the Transfer Function of the input mass. The square root of this Transfer Function will characterize the tube of half length. The mass of a snowball, that rolls down from the hill, can be considered as a function of the path it already have passed. At fixed length of this path (that can be determined by the altitude of the hill) this mass can be considered also as a Transfer Function of the input mass. The mass of the snowball could be measured at the top of the hill and at thе bottom, giving the Transfer Function; then, the mass of the snowball as a function of the length it passed is superfunction. If one needs to build-up an operational element with some given transfer function , and wants to realize it as a sequential connection of a couple of identical operational elements, then, each of these two elements should have transfer function . Such a function can be evaluated through the superfunction and the Abel function of the transfer function . The operational element may have any origin: it can be realized as an electronic microchip, or a mechanical couple of curvilinear grains), or some asymmetric U-tube filled with different liquids, and so on. рычага, поднимающего Землю, и нынешний с хорошо известной эмблемой в виде корня из факториала, вписанными в букву Ф. Этот значок, созданный студентом кафедры биофизики А.Сарвазяном, привлекал своей простотой и выразительностью. Тогда эмблема этого значка подверглась жесткой критике со стороны руководства факультета, поскольку она не имеет физического смысла, математически абсурдна и идеологически бессодержательна. На значке физфака в букву "Ф" вписано стилизованное изображение корня из факториала (√!) - выражение, математического смысла не имеющее. ↑ H.Kneser (1950). "Reelle analytische L¨osungen der Gleichung und verwandter Funktionalgleichungen". Journal fur die reine und angewandte Mathematik 187: 56-67. ↑ P.Walker (1991). "Infinitely differentiable generalized logarithmic and exponential functions". Mathematics of computation 196: 723-733. ↑ 6.0 6.1 D.Kouznetsov. (2009). 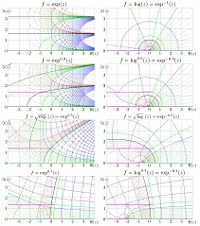 "Solutions of in the complex plane.". Mathematics of Computation, 78: 1647-1670. DOI:10.1090/S0025-5718-09-02188-7. Research Blogging. ↑ Kouznetsov, Dmitrii (2010). "Holomorphic extension of the logistic sequence". Moscow University Physics Bulletin (2): 91-98. This page was last modified 14:12, 10 October 2013.